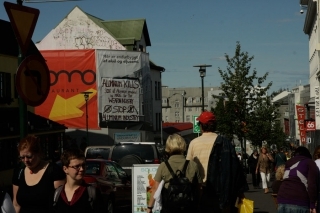 Yesterday, Friday August 7th, Saving Iceland protested by the Ministry of Industry. 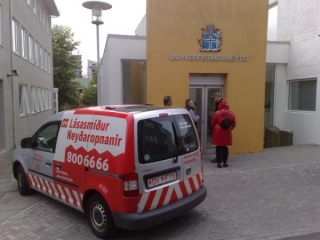 At the same time inside the building, a financial contract was signed between the government and Norðurál/Century Aluminum, concerning the latter’s smelter in Helguvík. When the protest was about to end, the police showed up, arrested 5 individuals and aggressively roughed up one of them. Most of the media has spoken about the event but not mentioned the police brutality at all. 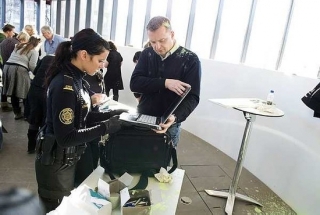 Instead, the media has unsparingly published the police’s smear about us: that a policeman was kicked in the head and that we threatened the police with iron sticks, without any evidence showing that anything like this ever took place. Saving Iceland rejects these accusations and renounces the media’s one-sided reports. Saving Iceland Targets Alcoa – The Only Way to Real Changes Lies in the Protection of Nature! 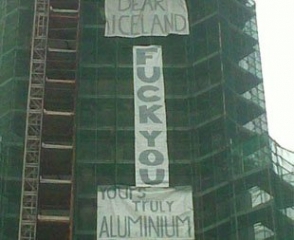 Last Tuesday, August 4th, Saving Iceland targeted the aluminium producer Alcoa. We knocked on the doors of the company’s office by Suðurlandsbraut but nobody answered, so the green skyr (traditional dairy product – historical for being used in protests) and other filthy stuff we had, ended up on the door, walls and the floor in front of the office. 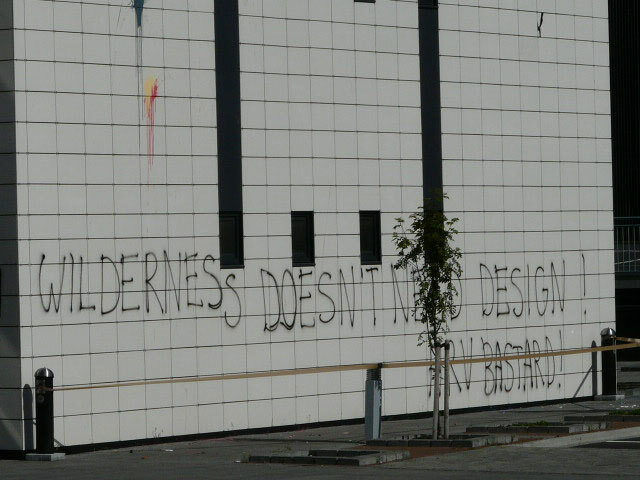 Compared to Alcoa’s role in the destruction of Iceland’s wilderness and other environmental and human crimes across the globe, this was a minimum punishment. This morning we, the Aluminium Industry, hung a banner on Hallgrímskirkja (the biggest church in Iceland) to finally express cleary what we have been trying to tell you all of the time. We decided that the methods of greenwashing and manipulation are no longer needed, since we obviously managed to convince you already about the glory of heavy industry. Earth-damage and pollution are constantly increasing as we keep trying to fulfill our never satisfying greed. We want our lives back. Our freedom. Our wilderness. We decide not to delegate to others what we believe is necessary to be done. We take the responsibility of our acts against those who are destroying and poisoning the Earth. Thinking that someone else than you will act or that nothing can be changed, is still a choice that has consequences. We can choose between oiling the destructive machine of this society or to be the sand that blocks it! The individual responsibility is the reason why we hit personally those who are at the head of capitalistic companies as Landsvirkjun. 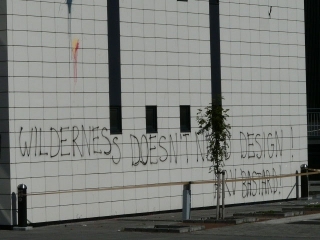 In the name of money and power, Landsvirkjun has actively destroyed the Icelandic wilderness. Company’s director does not change personality between his work and home. He stays the same. He is as responsible on both sides. In the night of July 27th, we went to the house of Friðrik Sophusson, the director of Landsvirkjun. 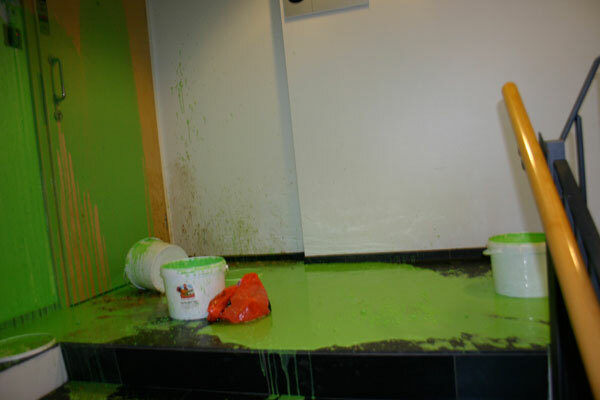 We blocked his doors with glue and threw green paint all over the walls. Never forget that the night is on our side! 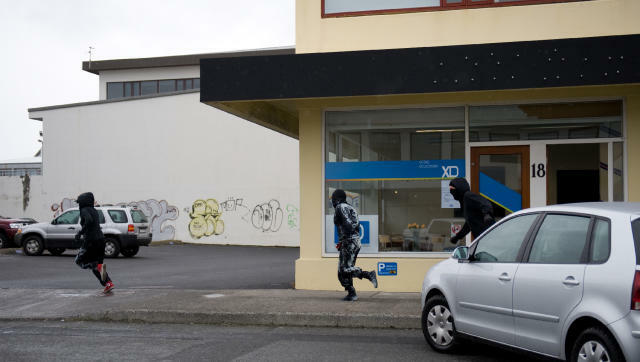 During the last days, a number of small actions have taken place in Reykavík; banner drop in the center of Reykjavík, graffiti and stinky liquid at Jarðboranir and a nighttime shut-down of Útlendingastofnun. Last night Saving Iceland closed the offices of companies and institutions that are heavily responsible for extreme destruction of nature. Super-glue was put in to the locks and signs put up saying: “Closed because of destruction of nature!” Locksmiths had to be called to open the doors when workers showed up in the morning. Saving Iceland applauds the symbolic hits that the three pro-heavy industry political parties were dealt in the form of liberal splashes of green skyr (traditional Icelandic dairy product) on Monday. According to Saving Iceland’s sources, three different groups, not just one, like the corporate media have claimed, did these actions almost simultaneously. 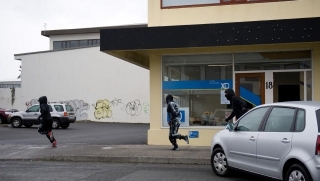 Saving Iceland has also been informed that the activists were all Icelandic. It appears that this is a powerful group of activists, fighting the heavy industrialization of Iceland. Saving Iceland declares full support with the group. The forces that stand behind Sjálfstæðisflokkurinn (Conservatives), Framsóknarflokkurinn (Right-wing opportunists) and Samfylkingin (New Labour equivalents), are guilty of what is tantamount to high treason with their heavy industry policy. Judging from their election propaganda, there is no sign that the parties have been willing to learn anything from the economic collapse about the expansion effects on the economy by heavy industry. Today, green ‘skyr’ (traditional Icelandic dairy product) was thrown at the election offices of three political parties, which are responsible for the invasion of the aluminium industry into Iceland. 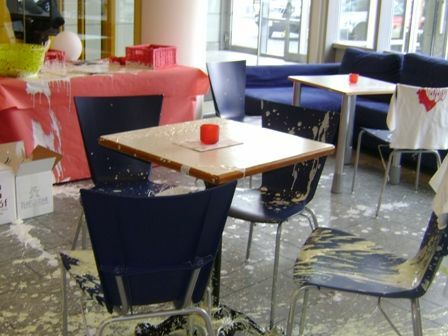 Skyr throwing is the Icelandic equivalent of pie throwing and has become a tradition in the environmental struggle; the last similar action took place only one and a half month ago. Yesterday three black dressed individuals, masked with aluminium foil, threw green Skyr (traditional Icelandic dairy product) on representatives of Icelandic energy companies during a greenwash presentation in the University of Iceland. In June 2005 Saving Iceland threw Skyr on representatives of Alcoa and Bechtel during an international aluminium conference in Reykjavík.